As of recent, my life has been a bit crazy with work, so I haven’t felt a whole lot like cooking. There has been a lot of pre-made salads and random left-over meals instead of thought-out dinners. A nice cooked dinner with time and effort is a pleasure of mine, though it is not happening at the moment. Well, I’m hoping it gets better as a new routine settles in eventually. I basically make a big batch of different salads on the weekend and have it straight out of fridge during the week. Legumes, grains and rice are great in cold salads and last long in the fridge. This salad is nice and clean. Crunchy raw broccoli, protein-packed chickpeas, creamy and fluffy millet with a simple mustard-vinegar dressing. I used raw broccoli here, but feel free to steam or boil if you wish. 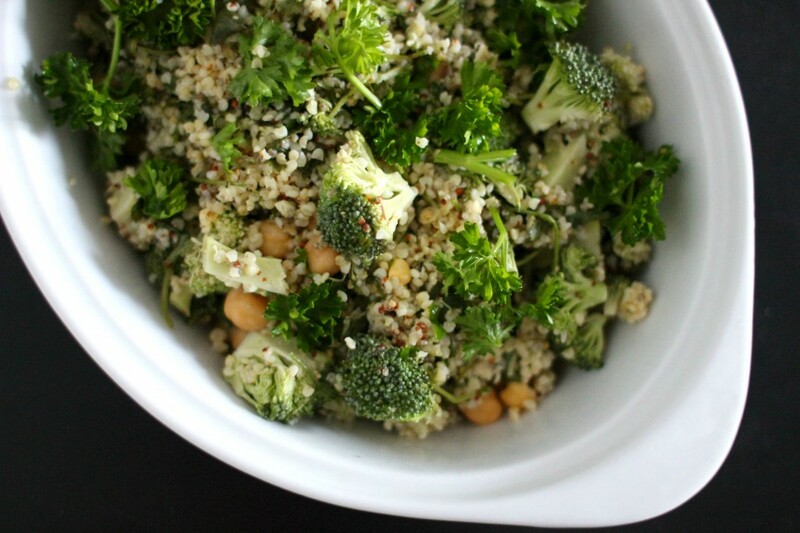 Combine cooked millet, chickpeas, chopped broccoli and parsley in a large bowl. Mix all dressing ingredients in a separate bowl or a jar with lid. Pour the dressing over salad and toss together. Serve as main or sides.